The DC Comics: A Visual History Updated Edition Hardcover Book highlights the debuts of iconic super heroes like Superman and Batman and the geniuses that invented them. The DC Comics: A Visual History tells of the real-life events, like the Vietnam War, the atom bomb, and the Space Race, that shaped the atmosphere of the times. DC Comics: A Visual History follows the characters' foray into the real world through TV series and blockbuster movies. 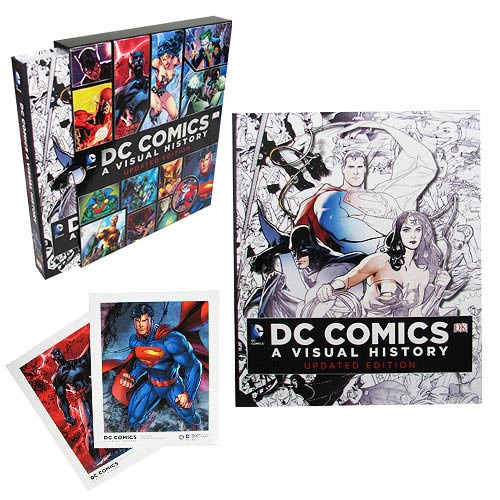 The DC Comics: A Visual History Updated Edition Hardcover Book features a slipcase design along with 2 prints packed inside. 376 pages. Measures approximately 12 1/2-inches tall x 10 1/2-inches wide. Ages 14 and up.